New work from Kadie Salfi’s series, Every 16 Hours, a title that calls attention to the fact that every 16 hours a woman is shot and killed by a current or former partner. Each work is painted with make-up on plywood. © Kadie Salfi, 2017. Courtesy of the artist. Kadie Salfi does not believe we are paying enough attention to gun laws and the impact that these laws have on women. The gun laws are “way too loose” in the artist’s opinion. Through SNAFU, a collection of life-size replicas of the guns used in American mass shootings from 1966 to present, where five or more people were killed, Salfi explores our country’s troubled relationship with guns. 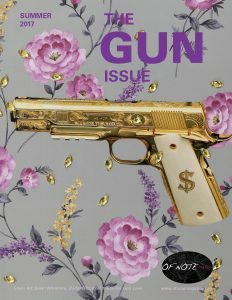 She symbolizes each shooting via a life-size painting of the gun used to commit the act, emphasizing, through the repetition of form, the ubiquity of guns in America. 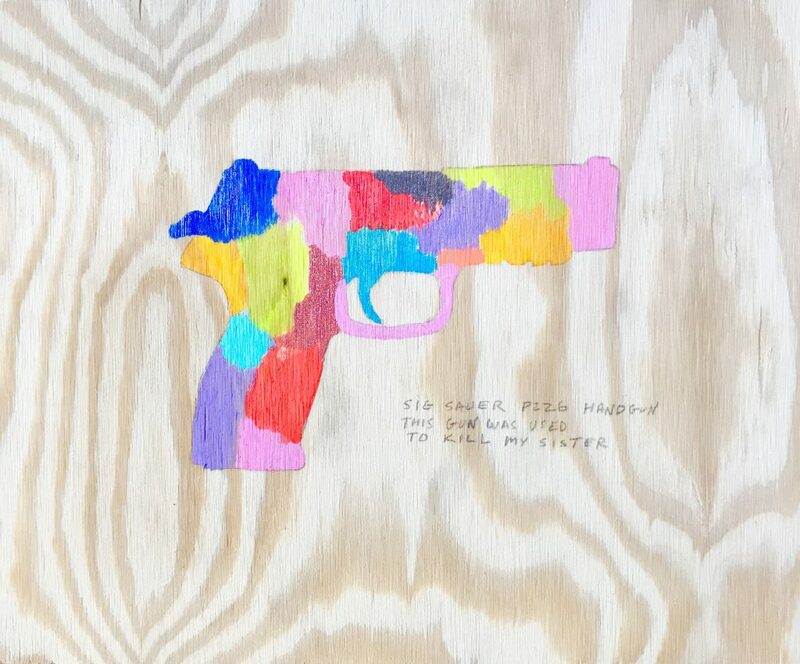 In presenting the gun over and over again as a work of art, Salfi shows how the object functions as a politically-charged weapon. 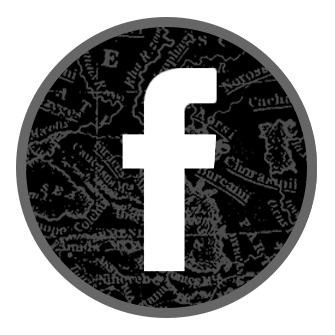 The granddaughter of a war hero and navigator of a B26 airplane in World War II, Salfi came up with the war acronym ‘SNAFU’ (‘Situation Normal All Fucked Up’) to describe the series. “I am trying to stimulate conversations about hard subjects that may inspire creative thought, change, and action to alter our relationship with guns,” she says. Interested in maintaining a relationship between the subject of guns and material, Salfi says that she “always thinks about the form as much as the content.” She works with simple materials, careful to maintain an elegant respect for the subject matter. She is keen not to turn her work into “shock art.” The choice of material holds significance for the artist; the pieces of wood she uses are recycled scraps from the skateboard company Salfi and her husband own. The grain of the wood and the knotted, coalescing marks and crevices which occur naturally over time on the wood’s surface speak to the deeply turbulent and interwoven nature of the mass shootings the artworks address. The Sandy Hook shooting in 2012 was a catalyzing force in the creation of SNAFU. Salfi, the mother of a young daughter, recalls weeping as she heard a story on the radio about a mother crawling into the still-warm bed of her deceased child, upon hearing the devastating news of the shooting. Salfi drove home to hold her own daughter’s sheets to see if they were still warm. They were. It was a tender and chilling moment for the artist, and one which inspired her to take action. Scared to send her daughter to school the next day and disturbed by how pervasive gun violence had become in America, Salfi decided to focus on the theme of mass shootings in schools as SNAFU evolved. Life size painting of one of the guns used to kill 26 people at Sandy Hook Elementary School on December 14, 2012. © Kadie Salfi, 2014. Courtesy of the artist. Although the larger project of SNAFU looks at all gun violence in America, with women in the United States accounting for 84% of all female firearm victims in the developed world, it is not surprising that many of the victims of the mass shootings Salfi covers are female. Perhaps the most shockingly evident case of a mass shooting related to misogyny was the Santa Barbara shooting in 2014. Elliot Rodger, who targeted a sorority house at the University of California, allegedly belonged to an anti-women group. Roger, who killed six people before taking his own life, directed his rage toward women, evidenced in a 141-page manifesto he produced. 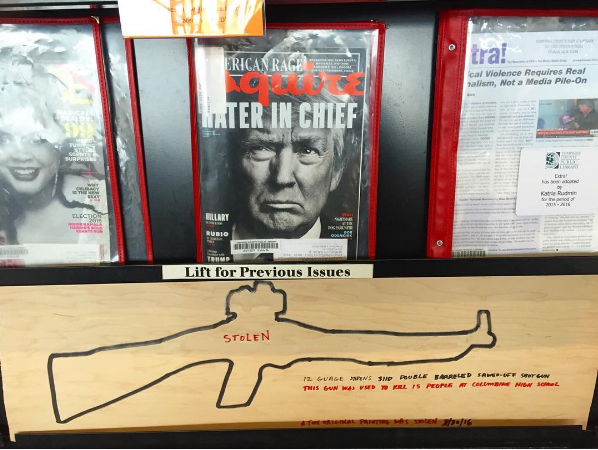 The choice to render the life-size guns in red acrylic paint against the plywood may seem obvious for a project about mass shootings. Red is the color of danger and bloody violence. Yet, the red guns operate on a literal level as well as a symbolic level—they reflect a psychological and political state of alarm. Salfi documents each shooting with facts. She handwrites the gun’s make and model number, and the victim’s name in white and blue letters. It is literally a red, white and blue America. The alarming red of the gun, in addition to its connotations of blood and danger, harnesses the viewer’s attention before they encounter the more subtle handwritten content. 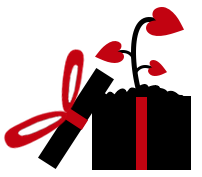 The writing of the victim’s name is barely visible, an intentional decision by Salfi. It speaks to the invisibility and anonymity of victims of gun violence. Salfi is careful to avoid mentioning the killers’ names anywhere throughout the SNAFU series. By presenting the facts of the shootings, she refrains from imbuing her work with bias or blame. 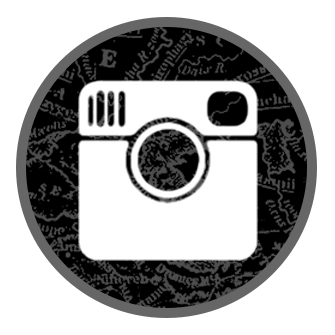 She is instead interested in capturing and preserving the reality of the moment. 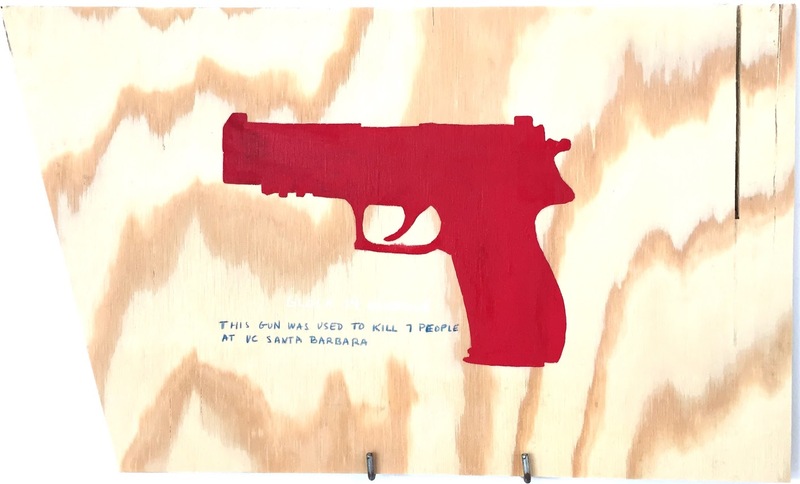 Life size painting of one of the guns used to kill seven people at UC Santa Barbara on May 23, 2014. © Kadie Salfi, 2016. Courtesy of the artist. This simplicity in her approach allows the viewer to focus on the scale of each weapon used, and their sizes, which range from a small handgun to a large automatic weapon. The point Salfi is trying to make here is that, ultimately, the type of gun used does not make a difference to the outcome—all guns kill, no matter their size or purpose. ♦Every day, three women are killed by current and former husbands or boyfriends…in situations of domestic violence where a gun is present, a woman is five times more likely to be killed. ♦Domestic violence plays a role in the majority of mass shootings. Every identifiable mass shooting between January 2009 and July 2014 found that 57% of them involved the killing of a family member of a current or former intimate partner of the shooter. ♦Around 96% of mass shooters are male. In mass shootings, it is not uncommon for the gunman to have a history of domestic violence. In fact, psychologists are starting to uncover overt similarities between the possible motivations behind intimate terrorism of domestic violence and mass terrorism perpetrated by single attackers. On a surface level, both are attempts to assert power and provoke fear. There are plenty of examples to draw from: Omar Marteen, who killed 49 people in a nightclub in Orlando, Florida in 2016, was a domestic abuser who severely beat his ex-wife. Ninety minutes after Cedric Ford was served with a restraining order in 2012 by his ex-girlfriend, he shot 17 people at his Kansas workplace. In 2015, David Conley methodically shot his ex-girlfriend Valerie Jackson, her husband, and six children in the head after breaking into her home in Houston, Texas. In states that require background checks, 47% fewer women are shot. This statistic proves that making access to firearms more difficult and having a more vigilant application process lowers the risk of gun-related deaths. Yet, there remains significant limitations to the federal laws set in place to prevent access to firearms by domestic abusers. For example, dating partners are not within the federal prohibitions. This is a problem as just as many women are killed by dating partners as by spouses. As Salfi sees it, regulating who gets access to guns is a good start, but it will not abolish gun-related violence completely. Salfi grew up in the presence of guns. Her father, an avid duck shooter in Vermont , kept his equipment in the basement of their Burlington home, a room which Salfi avoided. Salfi’s uncle also kept a gun in his home, one which he inherited from his father. When the artist was 28, her cousin took his father’s gun and shot himself, taking his own life. For Salfi, that pain was indescribable. She now resides in Ithaca, having moved there in 2007 from the Bay Area—and has witnessed how gun violence marks these very different cities. Life size painting of one of the guns used to kill 10 people at Umpqua Community College on October 1, 2015. Shown here on view at Tompkins County Public Library in Ithaca, New York. © Kadie Salfi, 2016. Courtesy of the artist. In 2016, they were displayed in the Tompkins County Public Library in Ithaca, New York on book shelves where most people, who were not necessarily seeking out art, could see the work. Although there were mixed reactions, the feedback was predominantly positive, with library visitors thanking Salfi for addressing the issue. Some, however, did not feel that the public display of such a disturbing and political subject matter belonged in a library setting. But Salfi wanted a public library as the location for this artwork because it is a space associated with learning and the sharing of knowledge. By placing these specific pieces in a public space where children, students, parents and families frequent, Salfi transforms the art project into a public education project. Life size replacement piece Salfi made of one of the guns used to kill 13 people at Columbine High School on April 20, 1999. Shown here on view at Tompkins County Public Library in Ithaca, New York. © Kadie Salfi, 2016. Courtesy of the artist. The public display component of these pieces allows for an interactive and tactile viewer experience, but it also means that the artworks are easy to remove, especially since the plywood is relatively light. 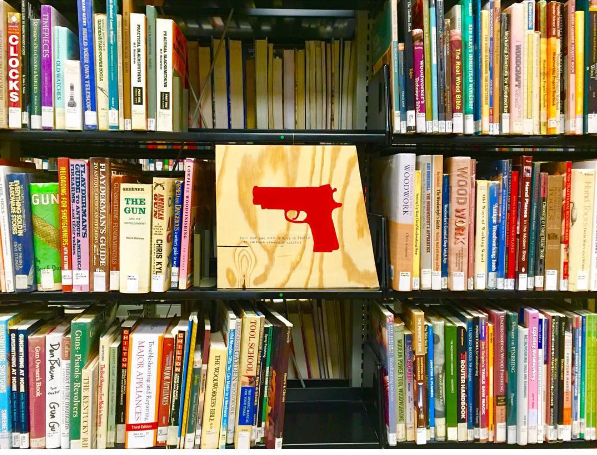 After only three days of being on display on the book shelves, the Columbine art piece, about the 1999 high school massacre of 12 students and one teacher, was stolen. Salfi was above all curious to know the poacher’s motives. It was not a particularly valuable piece in terms of monetary worth, nor was it the type of piece one would want to hang in their home. This left Salfi questioning whether whoever took the painting had a particular positive interest in the weapon or in the shooting, a thought that unsettled her. A month later the original was returned, anonymously. 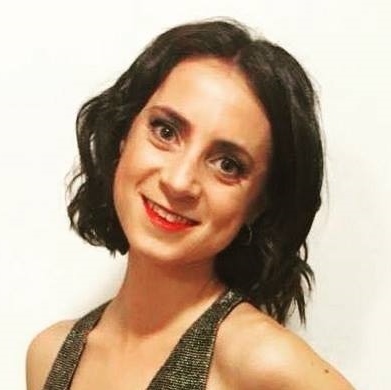 Katie Beeton is an avid writer and advocate of the arts. Born and raised in England, Beeton obtained a first class honours degree from the University of Sussex in B.A History of Art with a Proficiency in Italian, and then went on to graduate with a Masters of Arts Politics from Tisch School of the Arts, New York University. Interested in the intersection of contemporary arts and politics across diverse cultures, Beeton has worked within galleries, auction houses, and online art companies in London and New York. 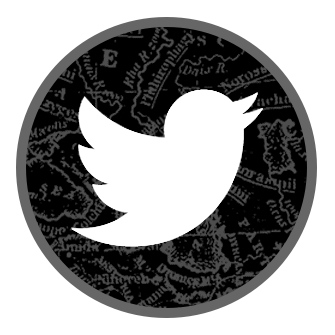 Beeton is currently based in New York City and continues to write about and explore the world of art and activism.